The Maremma is a large white or cream colored dog, usually weighing between 70 and 100 pounds and standing 25 to 30 inches tall. It is described in the Breed Standard as being majestic, lively, sturdy, distinguished, intelligent, and courageous without being aggressive. 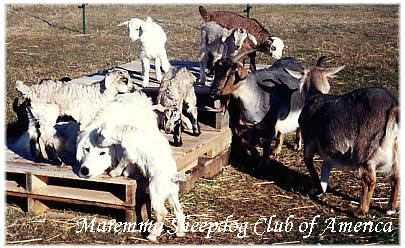 Properly trained, it has the ability to bond closely with sheep, goats, alpacas and llamas, with which it assumes a protective parental attitude, it demonstrate and an aloof awareness as leader of its adopted family, while at the same time readily accepting a secondary role to its bonded humans. A Maremma accepts the leadership of humans, but not their mastery. While being a good friend to man, the Maremma will not willingly be his slave. Born with exactly the right qualities for livestock guarding, the Maremma is not recommended for use as a pet. 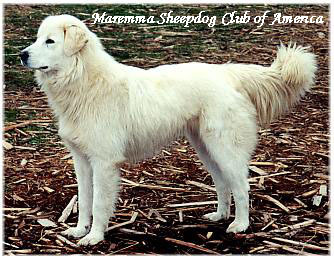 The independence necessary for solitary guarding of a flock makes the Maremma somewhat unwilling to take orders, and all of its behavioral characteristics that make it an excellent guardian tend to become stronger as it matures. The pet Maremma, without a flock and large area to guard, will gradually become more possessive of its bonded humans and of its limited territory, and more defensive of its possessions, while it will also become less discriminatory between friend and foe. 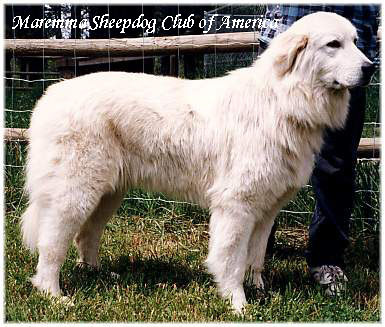 A successful Maremma guardian dog will be good tempered, ATTENTIVE to the stock, PROTECTIVE of the stock, and TRUSTWORTHY with the stock. 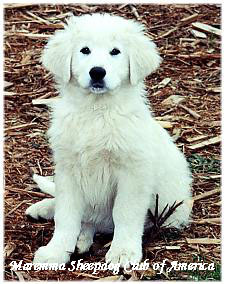 The ideal time for an inexperienced guardian owner to purchase a Maremma is as a recently weaned puppy so that it will bond strongly with its adopted family, its humans, and its territory as it grows. However, this also involved all the antics of puppy-hood; adolescence, and training in the "don'ts" of guardianship - it already knows all of the "do's" and will develop them on its own if exposed at the right time to appropriate guarding situations. Maremmas become mature, fully developed guardians at about age two. For these reasons, some people may choose to purchase an older dog, closer to mature guardianship, that will readily transfer to a new adopted family, new humans, and new territory if it has been treated properly up to that time. In any case, it is strongly recommended that you do some advance preparation. 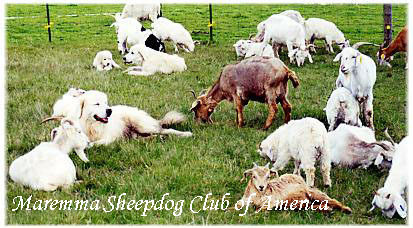 The Maremma Sheepdog Club of America (MSCA) sells a "how to do it" book at low cost that will be helpful. We also recommend that you buy your dog(s) from active guardian stock rather than from kennel-bred stock. Appropriate early exposure to the livestock-guarding situation is extremely important.